Customers selected Mega Storage Sheds for their next purchase after have a bad experience with another company. The images above show some of the numerous problems many customers encounter when dealing with companies who have no display areas where you can view the products prior to purchase or make a claim against your building . We strongly recommend that you verify with whom you are doing business with. Do your research before making such a large purchase, there are tons of pop-up companies which constantly change names, do not honor their warranties, etc. It is understandable that the consumer wants to save money, but is saving a couple of bucks worth a lifetime of headaches??? 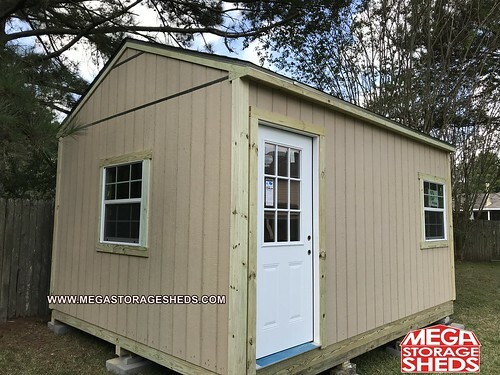 We also receive numerous calls and complaints from consumers who have purchased buildings with other companies, Mega Storage Sheds does not repair any type of damage from other storage shed companies! Please read carefully and review!!! Mega Storage Sheds reserves the right to request a down payment for any type of structure. Generally, for sheds being installed over the free 50 mile radius ½ down will be due before installation-this rule applies to ALL out of town builds! NO EXCEPTION!! Payment is due upon completion, unless other arrangements are made prior. If customer is not available for payment upon completion a late payment fee WILL be charged for any size/type of structure! Failure to do so will result in a late payment fee of $40-$60 (price will vary depending on location). All structures that require 1 week or more of construction time will have a mandatory contract, signed by both parties. City permits, HOA applications and any other applications are the customer’s FULL responsibility; if needed Mega Storage Sheds will assist with the permitting-application process, if drawings are required a 10% NON-REFUNDABLE down payment will be charged. Unless otherwise noted the 10% permit down payment will be applied to the customer’s full balance. Prior to placing your order please verify with ALL HOA’S, Deed Restrictions and or City Permits. Failure to comply will result in a cancel order fee (price will vary upon structure size). If any type of authority halts installation process due to customer not pulling permit, following HOA or Deed Restrictions, ½ of FULL BALANCE WILL BE DUE UNTIL CUSTOMER COMPLIES WITH NEEDED OR NECESSARY GUIDELINES! Mega Storage Sheds requires a 48 hour cancellation notice; unless arrangements are made directly with Mega Storage Sheds a cancellation fee will be charged. MEGA STORAGE SHEDS will NOT repair any type of structures built by other competitors, homeowners, etc. Mega Storage Sheds is NOT held responsible for recommending any extra options i.e. : ramps, ridge vents, windows etc. Mega Storage Sheds builders have exact materials on site to construct your shed. No extra options or changes will be made the day of or during the construction process. NO EXCEPTIONS!! The same rule applies to LEVELING; our builders carry exact materials if any extra blocks are needed aside from the standard; a trip fee shall be charged. Unless customer has made prior arrangements. Failure to mention an uneven area will result in an extra fee. If you have any questions, hesitations or simply need assistance with the order process please contact us, we will be more than happy to assist you. Slabs-If customer has an existing, new concrete slab or considering a concrete slab please contact us so that we may inspect it accordingly. Warranty will be voided if building is moved or transferred from original location. Once your order has been made NO adjustments or change orders are available, unless Mega Storage Sheds authorizes it. After your shed has been built we will not move the position of it, please make sure you have considered all placement options. If Mega Storage Sheds is asked to move position of shed we will try to satisfy the customer, but a moving fee shall be charged. 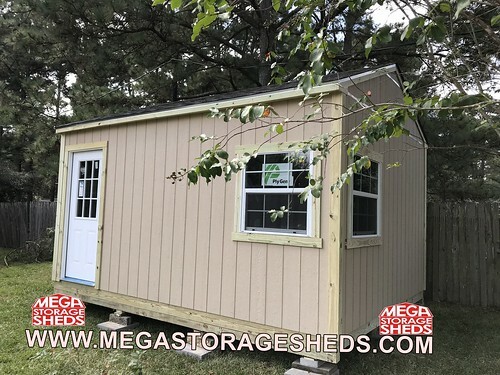 Please call Mega Storage Sheds for more information. Homeowner must be available at the time of delivery and installation, unless other arrangements have been made prior. If the customer fails to provide a 48 hour notice a cancellation fee will be charged. Also, a restocking fee of 30% will also be charge. Please review your order carefully; Mega Storage Sheds is NOT responsible for any errors made by the customer. Customer Maintenance Tips. Your custom storage building is constructed like your house; therefore it requires the same maintenance. The building should be painted within 30 days after complete installation, with the door being painted on all sides (front, back and edges). Trim all vegetation from the outside of the building to allow air to circulate underneath the building. Apply caulking above windows, doors and all horizontal trim.